Fix What’s Broken. Whether it’s a lack of bathroom storage space or a faulty showerhead, when something in the bathroom isn’t in proper working order, that’s a turnoff to potential buyers. You’ve been using the bathroom, so consider what doesn’t work well. Could new bathroom vanities make the room more functional, adding space to store cosmetics and other supplies? Could little shower updates like a new showerhead or new caulking make enough of a difference to make the bathroom impressive? Do you need a new toilet or to replace chipped tile? Start your remodeling project by thinking about what people want to see in sinks, showers, tiling and so on. Then, at the very least, make your bathroom one where everything is fixed. Out with the Old. Vintage bathrooms can be fun and funky, but if it’s maximum selling power you’re after, be sure to update. Consider remodeling the bathroom from an outdated room into a sleek, modern masterpiece — at Modern Bathroom, we can help you determine how best to move from an old-fashioned look to a contemporary style. Whether it’s by replacing the flooring, refinishing the tile or overhauling the room top to bottom, we’re here to help. Appearances Matter. When talking about resale value, looks are important. Potential buyers evaluate bathrooms in terms of visuals — the colors, the style, the layout and the fixtures. To capture their interest, pay the most attention to the aesthetics of your bathroom, even more than to the high-end features no one sees. Buyers like to see new cabinets, new vanities, new showers, etc., because updated signals quality and value. 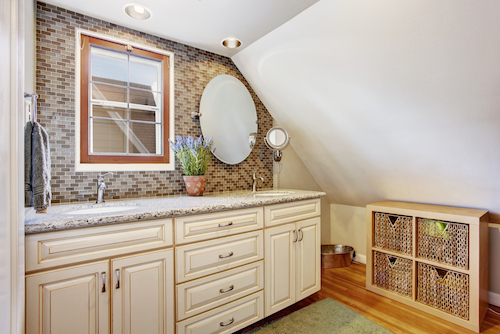 If it’s within your budget to take on a complete bathroom remodel, it might be worth doing. Small Details Matter. While new vanities and new tiling are the kinds of upgrades everyone notices quickly, don’t neglect the little touches like cabinet hardware, sink faucets and bathroom mirror frames. The small details in your bathroom design can either complement or take away from the room’s value — let yours be assets instead of hindrances. When it comes to replacing bathroom vanities or updating showers, Modern Bathroom is proud to be your No. 1 resource. Backed by years of experience in the industry, we have a team of experts committed to quality on every job — so when you want to take on a bathroom project in the Los Angeles area, come to us. Of all the rooms in your home, the bathroom is one of the easiest to convert to eco-friendly living. Time is spent in your bathroom every day, which means you’re sure to get your money’s worth from any eco-friendly upgrades that are installed here. Let’s see how you can save money and protect the planet by cutting water and energy use in your bathroom. If you’re like most families, you use more water in your bathroom than anywhere else — and much of it is hot water, which adds to your energy use. Switching to water-wise fixtures will help reduce both your impact on the planet and your utility bills. The easiest place to start is with a low-flow showerhead. This is an inexpensive device that can cut hot water consumption by 40 percent. 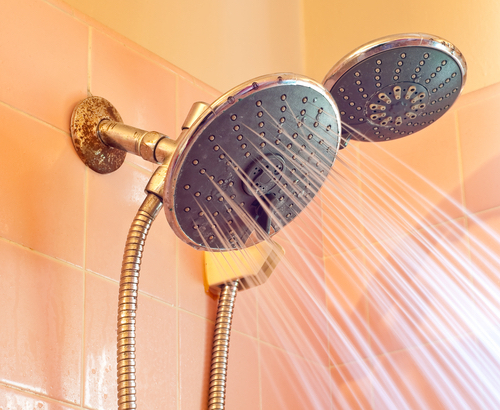 You can replace a showerhead in a matter of minutes. By doing this, you’ll be saving resources with every shower you take. Standard showerheads spray at about 2.5 gallons per minute. An eco-friendly showerhead uses no more than 2 gallons per minute, and many use less than that. The nicest perk about it? You probably won’t even know you’re saving water! Today’s low-flow showerhead technology comes in a variety of styles, including standard, hand-held and rainshower. Whichever you choose, look forward to enjoying a luxurious and invigorating shower experience, despite using less water. 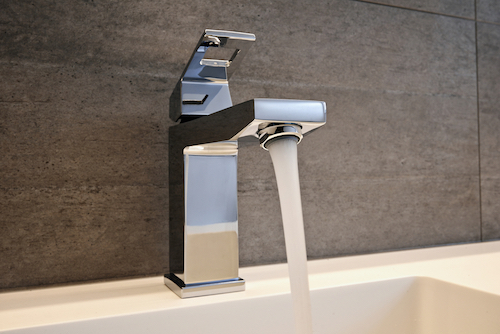 Choosing an eco-friendly, low-flow bathroom faucet can make a significant difference in your water use. Water-efficient bathroom faucets have a maximum flow of 1.5 gallons per minute, which can save 30 percent or more over the standard faucet. You need not sacrifice aesthetics to go green with your faucet, either. Dozens of attractive eco-friendly faucet models are available at all price points in styles ranging from classic to ultramodern. We also stock a number of low-lead faucets for those who are concerned about minimizing the risk of lead in drinking water. Depending on your current model, you could reduce your toilet water consumption by up to 60 percent simply by switching to a water-efficient toilet. According to Environmental Protection Agency (EPA) estimates, this could save you more than $2,200 over time. Eco-friendly toilets are available in many styles to suit any bathroom décor. Who benefits from eco-friendly bathroom products? An eco-friendly bathroom is great for you and your family because it can help limit exposure to harmful chemicals and/or save you money on water and water heating. It’s good for your community because you will be helping protect precious, local water resources. Plus, since everything in the environment is interconnected, when you invest in products that use resources wisely, it benefits everyone on the planet. If you are looking for green bathroom solutions, be sure to check out our line of eco-friendly bathroom products. We’ve carefully chosen a wide selection of water-efficient and earth-friendly bathroom fixtures and vanities sure to please any taste. We’ve also set up a special area on our website to make it easy for you to shop green. Or, if you prefer to browse general categories, just look for the green leaf logo on the bottom left of our product images. Of course, if you have any questions about how our products can help you go green in 2016, we’re here to help! Just call toll-free at 1-888-777-1198 or contact us online. Make the Most of the Space You Have. Even the smallest bathrooms can be more functional with a little strategic storage, so before doing anything else, decide if yours is being used to the fullest. Here are some ideas: Consider adding a glass shelf above the sink or above the toilet, in order to keep pretty toiletries on display or other items in eye-catching containers. Add a towel rack to the back of the bathroom door. Mount a high shelf above the entry door, as a place to keep paper products or towels. Place appliance hangers over the inside of cabinet doors to hold blow dryers or curling irons. The bottom line is to find as many creative ways to use your bathroom space as possible. Store Items Elsewhere. As nice as it is to have extra towels at your fingertips, putting them in a hall closet or laundry room cabinet also works. In order to free more bathroom space, try this and other strategies for storing some bathroom goods out of the bathroom. By paring down your bathroom items to just the necessities, will the current space work? Change the Pedestal Sink. In some bathrooms, a pedestal sink just doesn’t make sense because there is nowhere to put hair products, cosmetics, etc. If this sounds like you, it might be time to consider exchanging the pedestal sink for a vanity with bathroom cabinets. This is precisely why we at Modern Bathroom are committed to providing new cabinets that expand storage space and make your bathroom more functional. Contact us, and we can help you switch a simple sink with a bathroom vanity that can be an easy way to give your room the storage it needs. Add Other Cabinets. The vanity isn’t the only place where cabinets can add storage. Picture floor-to-ceiling bathroom cabinets where you’ll be able to store towels, toiletries, toilet paper and more. Add cabinets to other open nooks in the bathroom. At Modern Bathroom, we can create all kinds of bathroom storage solutions to maximize space. When you’re looking to add cabinets to your bathroom, look no further than Modern Bathroom. Our team of experts can provide the storage solutions you need. Contact us today to learn more, or visit our North Hollywood showroom and warehouse to view our vanities and other products in person. 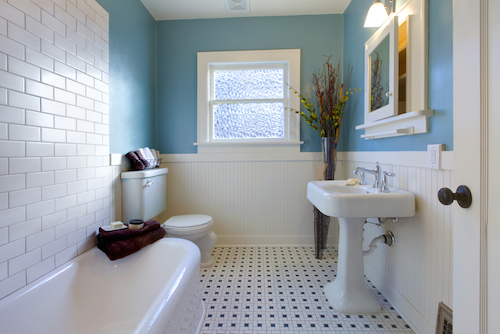 Updating a bathroom is an exciting prospect because you can create the exact look you desire. However, as anyone who has remodeled part of a home would tell you, renovations involve a lot of decisions — including your choice of bathroom faucet finish — and making those choices can be daunting. While at first glance bathroom faucets may seem like a small detail, your specific sink and shower faucets play an important role in finishing the look of your bathroom. Instead of leaving this decision to someone else, think carefully about the shower faucet or the bathtub faucet that goes in your new space. Visit a Showroom. Unless you’re already certain which faucet finish you like best, take the time to explore possibilities. Visit a showroom like our location in North Hollywood to view all the different finishes on display and see if something jumps out at you. Research online and browse magazine images. Exploring the wide range of finishes could help narrow your choices. Talk with a Designer. A professional designer can do wonders for helping you eliminate finishes that won’t look right in your home. Meet with someone to discuss your overall bathroom project and explore the perfect finishes to coordinate. Backed by some expert support, the decision may become much simpler. Consider Overall Design. Is your new bathroom going to have a rustic look, a sleek and modern style, or something more traditional? Whatever the answer, look for ways to use the finish to make the same statement. Whether it’s polished brass to create a vintage, classic style or oil-rubbed bronze for a Mediterranean look, your choice of faucet can highlight or detract from your design choices. Coordinate Finishes. Your bathroom will have a variety of faucets, from the ones at the sink to the one in the bathtub to the one on your showerhead. Choosing black, white, ceramic or steel is your choice — but make sure those choices coordinate among one another, as well as among other surfaces in your bathroom — like towel rods or light fixtures. Think about Upkeep. When it comes to upkeep, not all finishes are created equal. Some matte finishes are better at hiding water spots and smudges, which is ideal when you have a household of little fingers that want to grab at the waterspouts, for example. Other, shinier options may look lovely but require constant cleaning to look good. Know what will work best for you. Like most decorating and remodeling decisions, the finishes for your sink faucet, bathtub faucet and so on will largely be a matter of personal preference. However, when you’re stumped in the decision-making process and feeling unsure of what to do, consider the five tips above. Are you interested in remodeling a bathroom in the Los Angeles area? Let the experts at Modern Bathroom make the process a smooth and enjoyable one.